As stated in our blog “American Holidays and How We Celebrate Them,” Easter is celebrated on the first Sunday after the first full moon after the March Equinox. This day celebrates the Christian belief in Jesus Christ’s resurrection. Similarly, Palm Sunday commemorates Jesus Christ’s triumphal entry into Jerusalem. Palm Sunday is the start of the Holy Week which is the week before Easter. 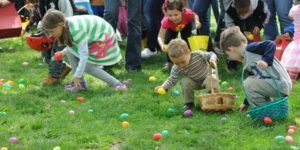 In the United States, to celebrate Easter, we might hide eggs for the little kids and let them find the hidden eggs with small prizes inside them. 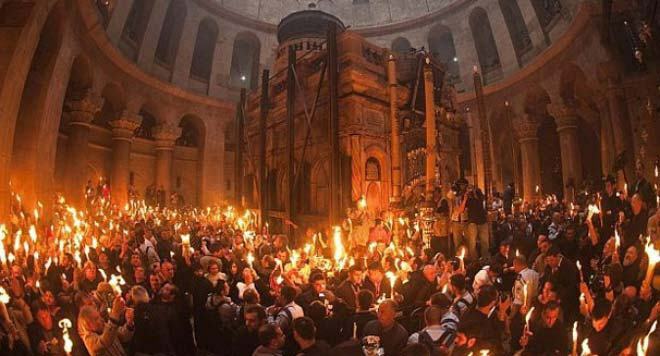 Many people also attend a special church service about Jesus’s resurrection after his crucifixion. In Washington D.C. the President hosts an annual Easter Egg Roll on the White House lawn on the Monday after Easter. Some believe this tradition dates back to the 19th century and involves children rolling a colored hard-boiled egg with a large serving spoon. 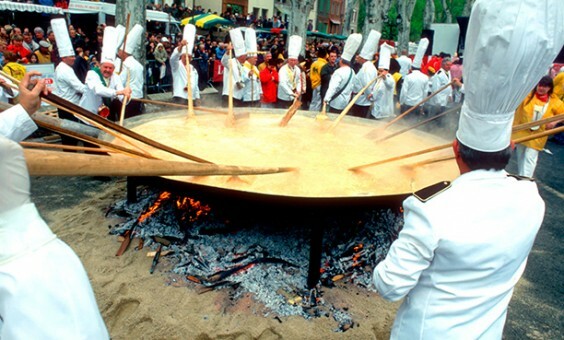 In Haux, France a giant omelet is prepared with 4,000 to 5,000 eggs that can feed almost 1,000 people. They say this tradition started because Napoleon and his army were traveling through the south of France and stopped in the small town of Haux to have a meal. Napoleon liked the omelet he had so much that he ordered the townspeople to gather all of their eggs and make a giant omelet for his army the next day, so the tradition continues. 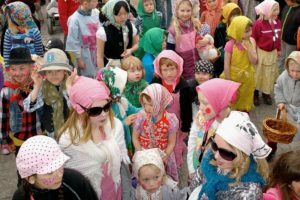 While America is having Easter egg hunts and France is making their omelets, Sweden is having what sounds a lot like an American Halloween. 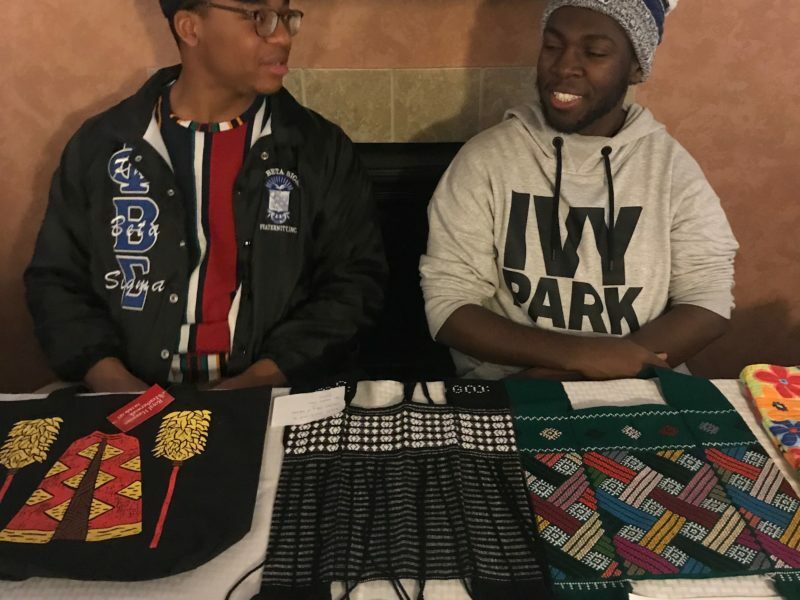 They dress up in long skirts, colorful head scarves, and paint their cheeks a rosy red to go from house to house in their neighborhoods, trading paintings and drawings for sweets. 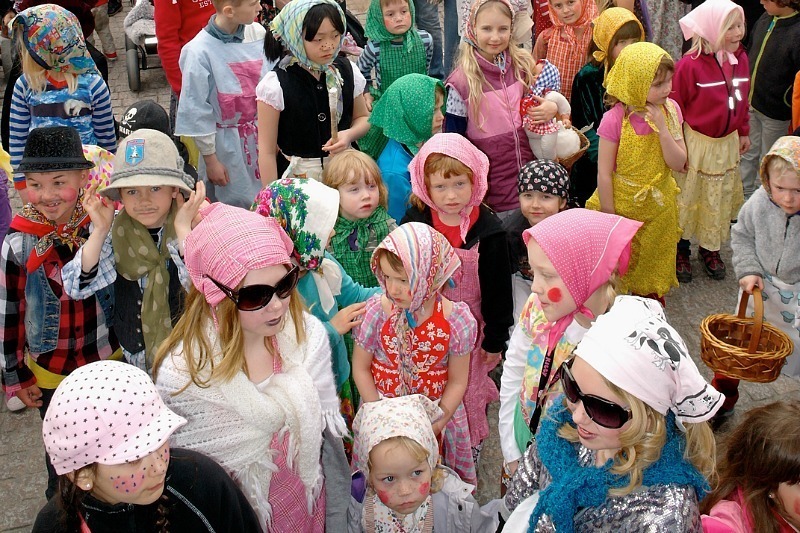 Children in Sweden dressed up for Easter. In Corfu, they have a tradition of “pot throwing” on the morning of Holy Saturday. The people throw clay pots and pans out of their windows and off of their balconies, smashing them on the street. 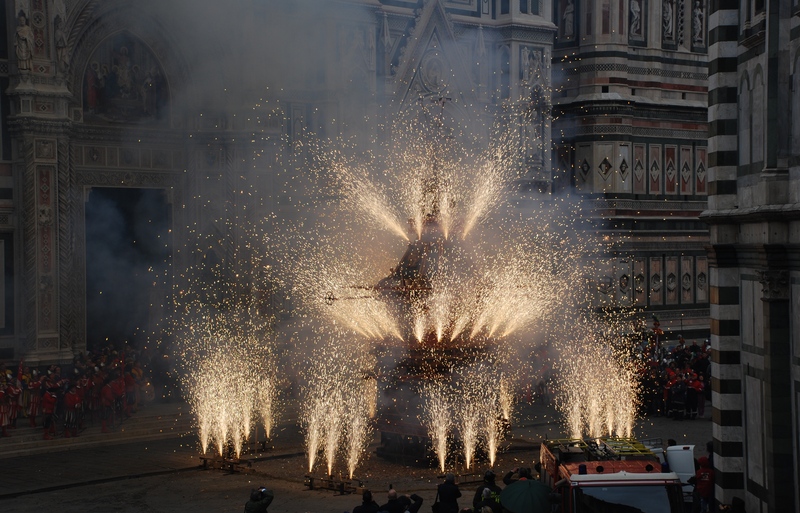 Some say the custom comes from the Venetians, celebrating the New Year, by throwing out all of their old pots and pans for new ones. In Florence, Easter is celebrated with a large decorated wagon pulled through the streets by white oxen until it arrives at the cathedral. Archbishop then sends a dove-shaped rocket into the cart, setting off a massive fireworks display called “Scoppio del Carro”. 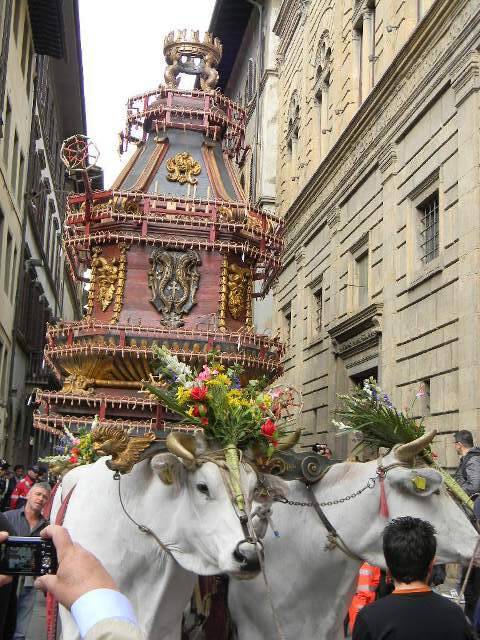 The cart pulled by the white oxen before Scoppio del Carro. Instead of hiding their eggs, in Bulgaria, they have egg fights! Well, sort of. They dye Easter eggs on Maundy Thursday or Holy Saturday. The first red dyed egg on Thursday is a symbol of good health and fortune for the family and is kept until the next Easter. The services for Holy Saturday begin at 11 pm. Bulgarians attend church and take their colored eggs with them. 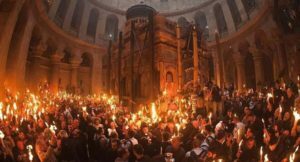 As soon as the clock strikes midnight, after church services, everyone says “Hristos vozkrese” (Christ has risen) to each other, and they respond “Voistina vozkrese” (Indeed, he has risen). Then they begin walking around the church three times with lit candles. There is a belief that anyone who is a faithful Christian will have a lit candle the whole time no matter how hard the wind blows. After the church services are over, there is an egg fight, or egg tapping, where the opponents smash their eggs into each other. The final person left with an unbroken egg is “The Winner” and keeps the egg as a sign of good luck. There is a belief that anyone who has a lit candle at the end of the walk is a faithful Christian. Two boys “egg tapping” to see who will have good luck throughout the year. Although many countries, like the United States, hide their eggs Germany does something a little different. 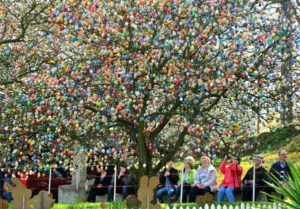 Instead, they hang their eggs in a tree. 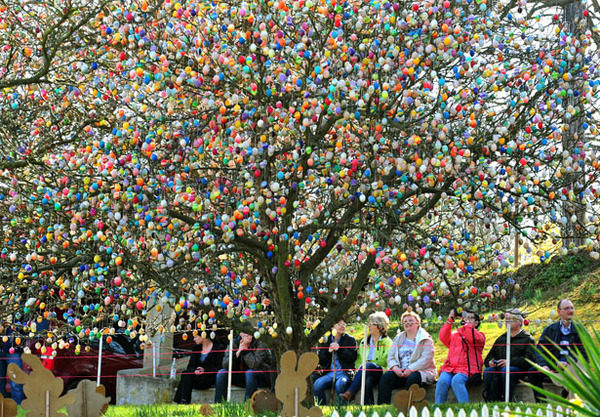 They adorn a tree in Saalfeld with thousands of Easter eggs. This tree lies in the garden of Volker Kraft. 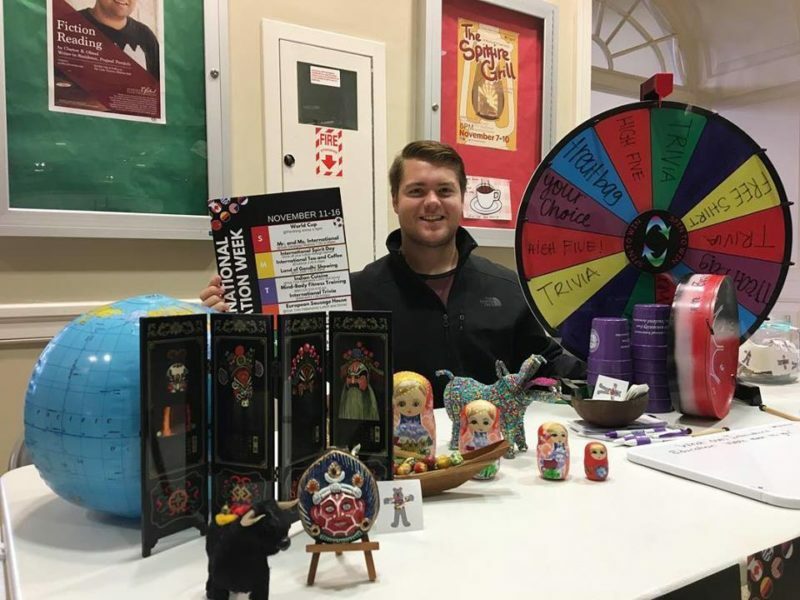 During the weeks before Easter, you will begin to see spring flowers on display and “Easter trees.” You can also buy eggs from neon plastic to traditional Sorbian eggs, which are available for purchase to celebrate Easter. 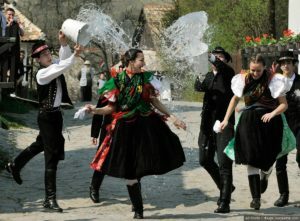 Sprinkling is a popular tradition in Hungary the Monday after Easter. Many boys playfully sprinkle perfume, cologne, or water over a young woman’s head and ask for a kiss. People used to believe that what they showered the young woman with, had a cleaning, healing, and fertility-inducing effect. Palm Sunday or “Flower Sunday” is also a day for house cleaning and egg decorating. On Easter Saturday and Easter Sunday, Easter baskets are blessed at the church and the people end their fast. 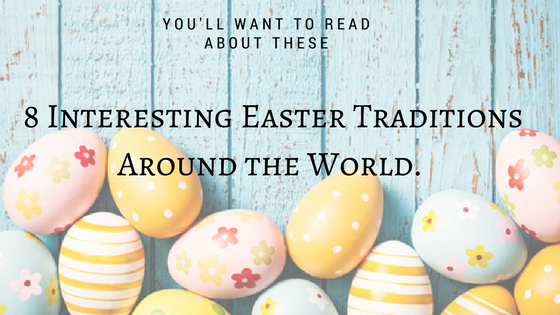 Easter is celebrated in many unique ways around the world! Truman students get a short break from classes to enjoy this holiday weekend with friends and family. Brenna is from the small town of Cassville, MO. 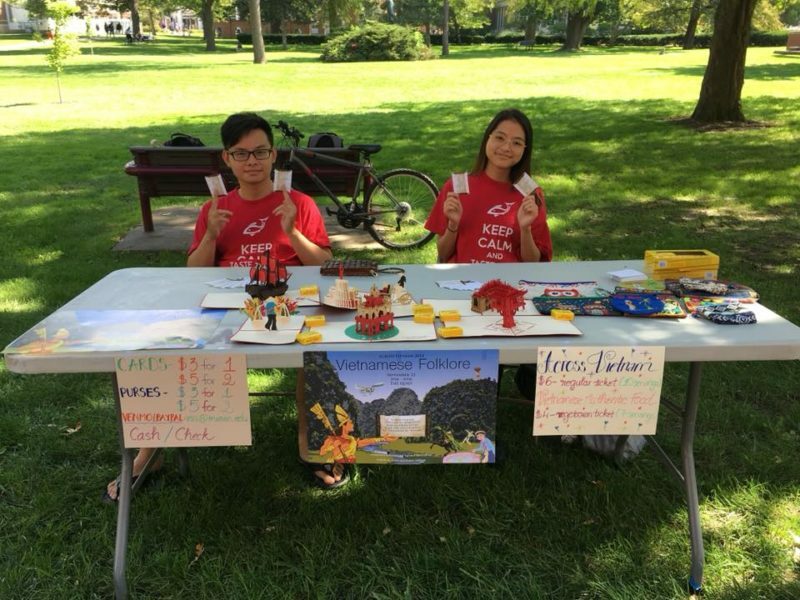 She is a Freshman pursuing her Master of Arts in Education and a major in French.